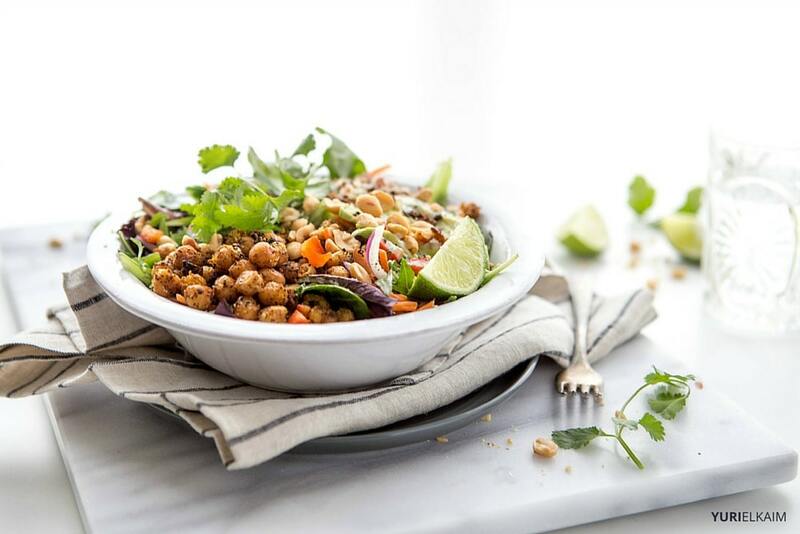 This Thai quinoa bowl is proof that healthy foods can taste great. Exploding with flavor, it makes a delicious lunch but the recipe could also be doubled and enjoyed as a dinner salad. You’ll notice that it contains curry powder. Not only does curry help it taste authentically Thai, but it is also full of anti-inflammatory goodness. The rainbow of veggies offer a range of antioxidants that’ll aid in preventing cancer, reducing cardiovascular risk, maintaining healthy bones and building collagen for healthy skin. This salad also contains plenty of protein, which will help keep you full longer. 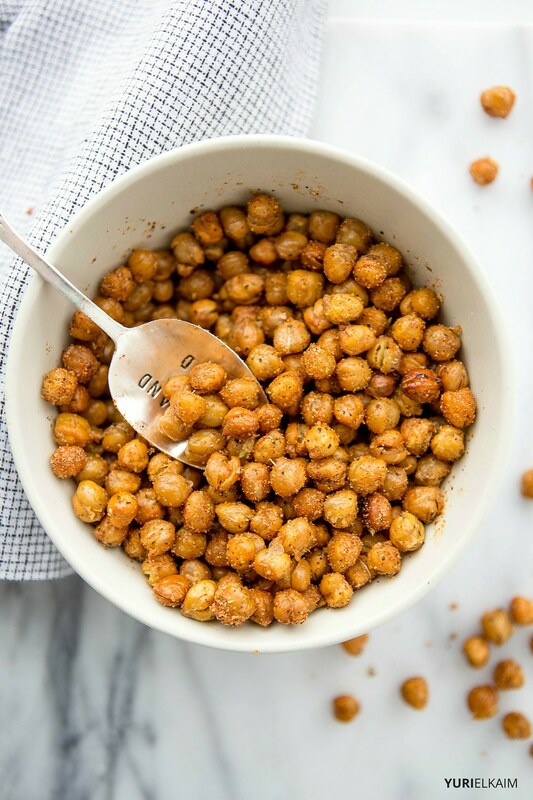 The crispy chickpeas, which offer a wonderful crunchy texture, contain a whopping 15 grams of protein per cup. I’ve also tossed some quinoa in there for added plant-based protein. Once consumed, protein breaks down into amino acids, which aid in maintaining and repairing tissue as well as transporting and storing important nutrients. Chickpeas are also high in fiber, which helps to keep you feeling full longer. In one 2010 study, participants consumed less food overall when on a chickpea-supplemented diet than on a non-chickpea diet (1). That being said, you don’t have to use chickpeas. They do work best for pan-frying but you could substitute black beans, Great Northern Beans and lima beans. Just keep in mind the final result won’t be quite as crunchy as chickpeas. To make sure you get really crunchy chickpeas, the best thing you can do is make sure they’re completely dry before pan frying. I recommend draining them, then pouring onto a paper-towel lined plate and letting them air-dry for 20-30 minutes before prepping this recipe. Once fried, enjoy immediately for the most crunch. 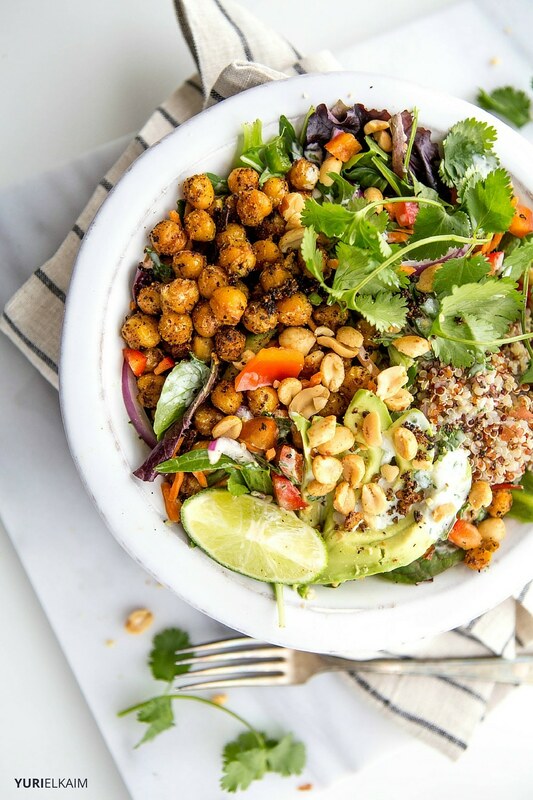 This hearty quinoa bowl makes for a deliciously filling dinner salad, while boasting incredible flavor and a protein-powered chickpea “crunch”. Heat coconut oil in a skillet over high. Toss chickpeas in salt, pepper, onion powder and curry powder. Place coated chickpeas in hot skillet, frying just until crispy and golden, about 3­5 minutes. (Note: as chickpeas cook, they can pop, so place your skillet on the back burner and use a long­-handled spatula for safety’s sake). Transfer chickpeas to a plate lined with a paper towel. Allow to cool slightly. In a bowl, toss together remaining ingredients. Sprinkle with chickpeas. Top with dressing. Enjoy! Whisk all ingredients together. Drizzle over salad. For extra Thai flavor, swap out the dressing for this Spicy Coconut ­Curry Peanut Sauce. In a microwave, heat just until melted and smooth: 3 tablespoons coconut milk, 1 tablespoon sesame oil, 2 tablespoons peanut butter, 1 teaspoon Sriracha, ½ teaspoon curry powder, 1 chopped garlic clove, salt & pepper to taste.